For most of Abe Osheroff's 92 years, he was an activist. 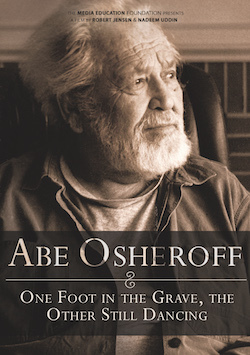 Whether he was on the front lines of the Spanish Civil War, walking the picket lines of the U.S. labor movement, marching for civil rights in Mississippi, or working for human rights in Nicaragua, Osheroff threw himself into the political arena with rare energy and enthusiasm. In this affecting film, Osheroff reflects on the meaning of activism, the reasons he took political action, and his lifetime commitment to "radical humanism." Osheroff's wisdom resonates with special force today, as new waves of social protest sweep the globe. "Nadeem Uddin's documentary of Abe Osheroff presents us with a great man I think not possible to envision in our present generation." "One Foot in the Grave, the Other Still Dancing is concerned with Osheroff the teacher and critical thinker, who, though frail and confined to a wheelchair, inspired young people, turning some to activism. The core of the film is Osheroff's speech to college students in 2007, at 'a period of American history when an empire is falling apart.' His prognosis for their future is one of increasing austerity, demanding more citizen engagement. While 'a better world is necessary,' he leaves them with the message that not only are authentic, aware lives the most rewarding, but they empower the action that makes a better world possible."